Do you love going on adventures with your dog? Of course you do! However, while you may think summer is the best time of year to explore the wilderness, winter can be just as much fun for both of you, especially on a hike. Whether you've never gone on a winter hike with your furry friend before, or if you're just looking for some more safety tips, our guide to winter hiking with your dog is here to answer all your questions. The first step to planning a winter hike with your dog is asking yourself: is my dog physically fit? During the winter season, trails may be very slippery or covered in snow. In both cases, a winter hike will usually take longer, so your dog must be fit enough to handle the trail conditions. The second step is to think about your dog's breed. Dogs with a thick coat, such as a Siberian Husky, thrive in cold temperatures and enjoy the snow. On the other hand, short-haired dogs, or breeds without an undercoat, such as a Pug, will get cold faster and may not like being outside for too long. Furthermore, puppies and older dogs should not be going on winter hikes. Not only does the cold affect them faster, but wading through deep snow can cause injuries. Research your dog breed, and find out how protective their fur coat is. Once you've decided to go on a winter hike with your dog, you should prepare for the trip ahead of time. Here are some frequently asked questions that all dog owners should consider. Where Should I Bring My Dog Hiking? For your winter hikes, pick a trail that is dog friendly. 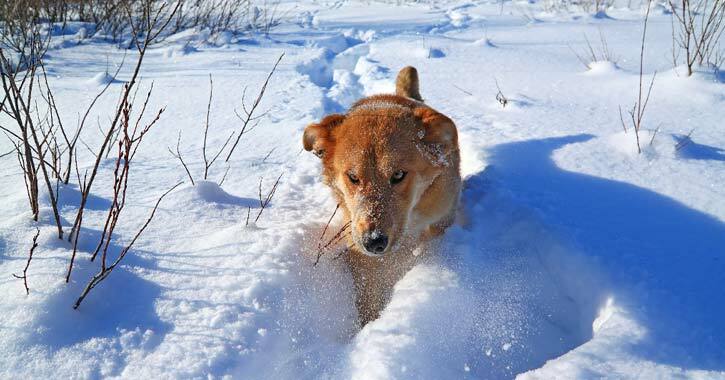 For example, dogs with short legs will get tired if the route is covered in deep snow, so try a trail that only has a few inches on it. If the snow gets too deep, you can always turn back. How Long of a Hike Should I Bring My Dog On? If your dog is used to short hikes in the summer, start with a short winter hike. You can always build up to a longer trip once your dog gets used to the conditions. For the average dog, if the temperature is below freezing, a short walk is recommended, around 10-15 minutes. If you feel cold, a dog with a less protective coat will also be cold. When the temperature is above freezing, you can go on a longer hike, such as a 30-45 minute one. If your dog can handle the cold for a longer period of time, then you can extend the length of the trip. On a longer hike, don't forget to take frequent breaks. How Do I Know if My Dog is Cold? What Do I Need to Bring On a Winter Hike? In addition to being properly prepared yourself, you'll want to pack stuff for your dog too. Bring all the usual items, such as water and treats, a collapsable bowl, and doggy bags. For winter, you may want to invest in a bright leash, a flashing collar, or an orange safety vest (for hunting season). What About Dog Booties or a Sweater? You've probably seen dogs with one or the other and wondered if your pet needs them too. While dog booties and sweaters/jackets are not 100% necessary for your dog to survive in the cold, they can be helpful as long as you know how to use them properly. Dog Booties - Dog booties may seem silly at first, but they do serve a purpose. When your dog has long hair around their paws, snow can get stuck there and cause extreme irritation. To prevent these snowballs on your dog's paws, some owners have their furry friend wear booties. Booties are basically a sock with a strap to keep them attached to the paw. They protect paws from snow, salt, and other de-icers. Some dogs won't like wearing booties, so it may take some time before they get used to them. If you want to try booties, you should pick a size that isn't too tight but can be made snug so it doesn't fall off. You don't want to cut off your dog's circulation. 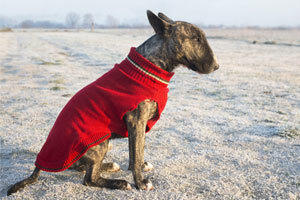 Dog Sweaters/Jackets - Dog sweaters and jackets can help keep short-haired dogs warm in cold temperatures. Conversely, sweaters and jackets can overheat a larger dog with dense fur because their own coat is protective enough. If you want to purchase a sweater or jacket for your dog, pick out one that won't drag on the ground, fits snugly but isn't too tight, and doesn't have anything that could be caught or torn off (zippers, hooks, buttons, tags, etc.). Make sure your dog's legs are free to move, and if possible, bring your pet to the store to try it on. The most important thing to remember with a sweater or jacket is that if it gets wet, you should remove it. You don't want your dog outside in winter with wet material on them. Once you've reviewed all of the tips above, it's time to find a trail near you and go on a new adventure with your dog.